The date for the BPPA AGM is fast approaching – May 4th 2017 – PLEASE COME ALONG!! It has been a good year for the BPPA – The highlight was definitely the “Assignments” exhibition – with lots of other good stuff going on behind the scenes! It would be great to see as many of you as possible on the evening for a pint and a chat about what the association has been up to – and what we hope to achieve in the coming year. You don’t even have to be a member to come along and take part in the discussion. In particular it would be great to see as many younger members and women photographers as possible – to move away from the “old geezers” image. We are hoping to make it a little more streamlined this year by producing an “annual report” for members to read beforehand – hopefully cutting down on the boring stuff and leaving more time for a beer and general discussion of things photographic. A copy will be made available on the members facebook page in the next day or two, and the agenda at the end of this week. If you would like to get more involved with making things happen we would love to have you! Just email chris.eades@thebppa.com with a short message outlining why you want to be on the board and what you hope to achieve in the next year and we’ll get back to you with more details. Likewise if anyone wishes to stand for the “officer” roles then they should declare their candidacy now. If anyone wishes to stand for these roles they need to give notice by Friday midnight – in order to give us time to organise an election. Likewise if there are any resolutions for the AGM that you wish to table please could you let Chris have them by Friday 28th. Finally thank you to everyone who has put in so much effort in the last year both in the spotlight and behind the scenes to make this such a good year for the BPPA. Hopefully next year will be even better – and we hope to see you all for a pint on May 4th to discuss how to make this happen. 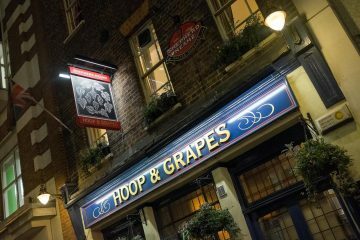 The AGM will be held at The Hoop and Grapes pub, Farringdon Street, London from 7.30pm on the 4th of May 2017. Parking nearby is limited but there’s plenty of public transport in the area.